The Commonwealth of Virginia is home to a number of American Viticultural Areas (AVA) such as Monticello (1984), the North Fork of Roanoke (1987) , the Northern Neck George Washington Birthplace (1987), Rocky Knob (1987), and Virginia’s Eastern Shore (1991), as well as sharing the Shenandoah Valley AVA (1987) with West Virginia. As you can see, the last AVA from the above list was Virginia’s Eastern Shore in 1991, with the remaining acquiring a designation in the 1980's. In terms of the contemporary Virginia wine making industry, that's ancient history and quite a lot has changed since those early petitions. For instance, the petitioner of the North Fork of Roanoke AVA, Woolwine Winery, was the precursor to Chateau Morrisette and this AVA as well as Rocky Knob are currently home to very few commercial vineyards. In contrast, the number of vineyards in Northern Virginia have escalated rapidly in the past two decades particularly in Fauquier County and its northern neighbor Loudoun County, where there are now over 60 wineries operating between the two. A viticultural area for American wine is a delimited grape-growing region having distinguishing features as described in the Code of Federal Regulations (CFR) at 27 CFR part 9 and a name and delineated boundary as established in part 9 of the regulations. These designations allow vintners and consumers to attribute a given quality, reputation, or other characteristic of a wine made from grapes grown in an area to its geographic origin. Take the term “estate bottled.” Up until now, a wine can be called “estate bottled” only if (a) it is labeled with an appellation of origin, and (b) the bottling winery is located in the labeled viticultural area, grew all of the grapes used to make the wine on land owned or controlled by the winery within the boundaries of the labeled viticultural area; and crushed the grapes (there are some additional restrictions). 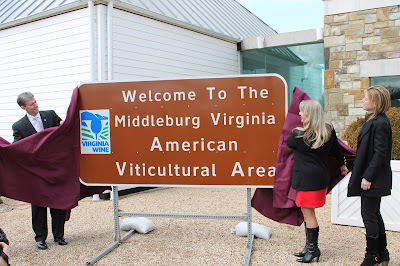 To finish reading about the AVA, visit Middleburg Gets Some Signage For Their AVA.